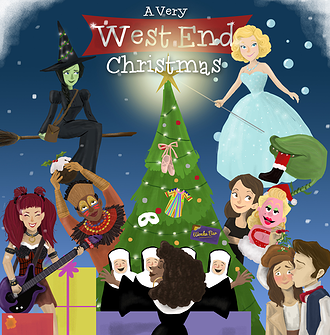 Cynthia Erivo, Simon Bowman, Sophie Louise Dann, Shona White, Scott Garnham, Jodie Jacobs & Michael Xavier are among a hot musical theatre stars who have recorded A Very West End Christmas EP. Co-producers Darren Bell and Kris Rawlinson brought together almost fifty stars of musical theatre, at the St James Theatre on the 14th October to record an album of Christmas songs for charity: the proceeds of which will be split between equally between Giggin’ For Good, which raises money for Great Ormond Street Hospital, West End Fests, which raises money for CRY UK and The Band Aid Charitable Trust. 1. Hark! The Herald Angels Sing – A Very West End Christmas Choir. 3. Oh, Holy Night –Sabrina Aloueche (Les Miserables, We Will Rock You), Jodie Jacobs (Rock of Ages) & Katie Paine (We Will Rock You). 4. Baby It’s Cold Outside – Chloe Hart (Wicked, Hairspray) & Jeremy Legat (Wicked). 5. Do They Know It’s Christmas? – tA Very West End Christmas’ Choir. Each track will be available for purchase, individually or as part of the entire EP, on most music platforms including iTunes and Amazon on 14th December 2013 which you can pre-order now. The artists involved (alphabetically): Sabrina Aloueche, Simon Bailey, Lucy May Barker, Will Barrett, Andrew Bateup, Jamie Birkett, Simon Bowman, Georgie Burdett, Ambra Caserotti, Jasmine Colangelo, Erin Cornell, Alexandra da Silva, Sophie Louise Dann, Jordan Lee Davies, Cynthia Erivo, Stephanie Fearon, Scott Garnham, Joseph Giacone, Chloe Hart, Keith Jack, Jodie Jacobs, Samuel James, Conleth Kane, Rosie Ladkin, Jeremy Legat, Hannah Levane, Sophie Linder-Lee, Leon Lopez, Shaun McCourt, Gabriel Mokake, David Muscat, Lauren Osborn, Katie Paine, Ian Parsons, Jennifer Potts, Helen Power, Tim Prottey-Jones, Michael Quinn, Ian Stroughair, Thomas Sutcliffe, Amy-Jean Ward, Shona White, Gary Wood, Thomas Wright & Michael Xavier.